The issue of genetic discrimination has attracted growing attention and has been the focus of a recent major Australian inquiry. It is, however, a complex and loaded notion, open to interpretation. This paper explores the concept of genetic discrimination in both its theoretical and practical dimensions. It examines its conceptual underpinnings, how it is understood, and how this understanding fits within the legal framework of disability discrimination. The paper also examines the phenomenon in practice, including the ‘fear factor’ and the resulting implications for the development of regulatory policy. The paper argues that we need to be discerning in our interpretation of this term, and differentiate between discriminatory conduct which is legal and illegal. 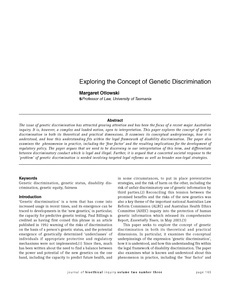 Further, it is argued that a concerted societal response to the ‘problem’ of genetic discrimination is needed involving targeted legal reforms as well as broader non-legal strategies.